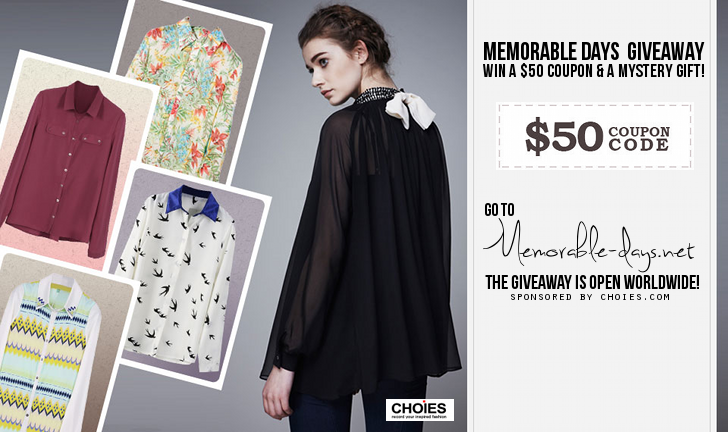 GIVEAWAY: Win a $50 CHOIES Coupon and a Mystery Prize! | Memorable Days : Beauty Blog - Korean Beauty, European, American Product Reviews. GIVEAWAY: Win a $50 CHOIES Coupon and a Mystery Prize! Hello sweeties ^^. I mentioned on my facebook and twitter before that i would host another giveaway this week. I'm super excited because the fashion shop Choies.com and I collaborated! They are selling lovely clothes including items from current trends like items with studs, spikes, cats, pastel clothing and more! I may give away a coupon code which is worth $50 and that's not the only prize, the winner will also get a mystery gift! Choies.com offers worldwide FREE shipping, so you don't need to worry about shipping costs. This giveaway is open worldwide, so everybody may join. Continue with reading if you would like to enter this giveaway! Please fill in the form below and you will stand a chance to win the $50 coupon and the mystery gift! Once again, it's a worldwide giveaway so everybody may join. This giveaway will end on the 5th of April 2013 23.59 PM GMT +2. Good luck! Make sure to do these 4 things below first to unlock the rest to get more entries! Thank you so much for entering and thank you Choies.com for sponsoring this giveaway!